In life I do various things, in death I will do less. Sculptures, paintings, installations, books and other useless stuff: my poor contribution to entropy. The “A Theory”. In this mapping of human chromosomes, observed through the microscope of art, in this “humane genome project”, which analyzes the DNA of the existence, and that I called androsophy, I use all possible methods of investigation, without any limits of form and means. I do not lock myself in the ghetto of the style or of the theme. Because often they become excuses to repeat the same work indefinitely, perhaps to please the market need to deal with artists who are always easily recognizable and identifiable by the unique characteristics that made them more or less known. I do this not only dedicating myself to various forms of art, but interlacing them, incorporating them, I make them rise from each other, I let them influence each other. Each of them is a part of the whole. From this considerations, came the idea of a “A Theory”, which mocks the well-known “M-theory”, which in theoretical physics is the theory of everything, that should gives an explanation of the laws of nature bringing them together. Much more modestly, the “A Theory” is instead the theory of my everything, which includes the seven androsophy guidelines, and all the works which they contain – as well as many works that I have now decided not to include in the site -, everything I’ve ever done with any discipline, material and technique. Intertwined to compose a single huge puzzle. Getting the right emotional distance, neither too close nor too far and neither too in favour nor too adverse, one can be able to see the whole and what it represents. In this sense, the “A Theory” refers to the practice of hybridity and to the supergravity that holds together these hybrids, hence any work I have ever done: including the theoretical structure of this site, the texts – including the one you are reading now – and even the very idea of androsophy. The divisions are never sharp, because often an issue is interlinked with others, but above all, are not determined by the medium or technique. – The sculpture “Art Funeral” was also an installation, then an entire exhibition and now a guideline. – The sculpture “Ego Bricks” was followed by a second sculpture, then it was an exhibition, and finally became a guideline. – The last line of the poem “Tivvù” has become a sculpture, then an exhibition and, finally, one of the guidelines. – The sculpture “Creed Card” was the protagonist of a passage of “Codice a bare“, a novel that also contains references to other works of mine. – Some sculptures like “War is a slippery thing, hundreds fall into it“, “Life is a party, a farewell party“, “Our Existence is just an advertisement for Life“,”I use to believe in God, then I was born” and others, are born from some of my aphorisms, which have become their titles. – The sculpture “The blue faint” has become the main character of one of the tales in the book “Sabba di Paralleli“, but before being a sculpture it was part of a comic I made in the eighties. – The sculpture “Integralienation” has a real painting on the surface. I could go on and on, but I think the concept is clear. There is a continuous interaction between the various things I do, they live together, they have the same goals, they just try to reach them in different ways. Although in hindsight, the ways are diverse but similar: diversimilar, as the title of one of my sculptures. Just like us humans. In fact, I have come to the point where it is increasingly difficult to draw a clear line between the various disciplines: when I am drawing or painting am I placing signs together just like when I write? When I make a sculpture am I drawing in three dimensions? When I write am I shaping phrases as if they were clay? So, to write a painting seems normal to me, as I do with the oil words of the paintings in the Sur-Faces series, and it is also normal to paint a sculpture, like I did with “Integralienation”: sometimes boundaries are only in the mind. 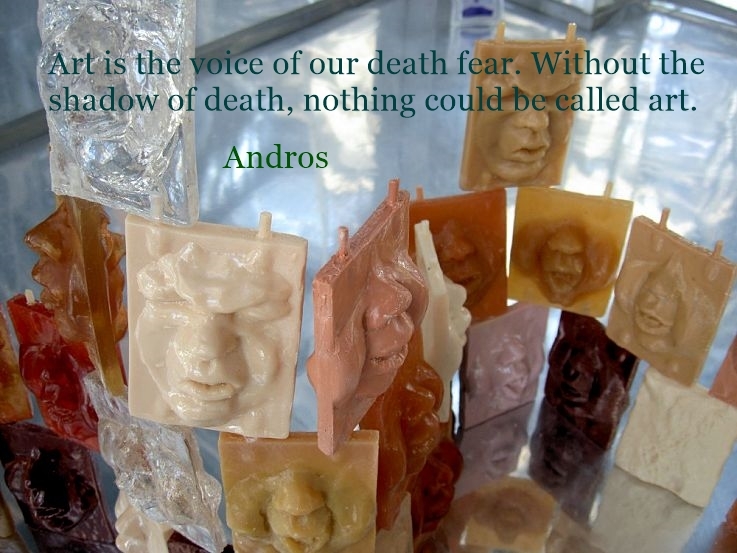 Read more about Andros here.